After clinching 7 medals on Day 8 of the ongoing Commonwealth Games 2018, the Indian contingent will look to continue their impressive run on Friday in the Australian CWG at Gold Coast. With Indian ace grappler Sushil Kumar making his presence felt at Gold Coast, 2016 Olympic medallist Sakshi Malik will compete for similar glory on Friday. In hockey, Indian men's hockey team will compete for a bronze medal. In badminton, ace shutllers PV Sindhu, Kidmabi Srikanth and Saina Nehwal will look to progress further in badminton singles. Day 9 saw lots of highs for India, complemented with a few lows as well. For starters, India’s Bajrang Punia won gold in men’s freestyle 65kg. This was India’s 17th gold at the Games. The shuttlers Saina Nehwal, Kidambi Srikanth and PV Sindhu are through to the semi-finals of their singles events scheduled for tomorrow, boxers Vikas Krishnan, Manish Kaushik, Gaurav Solanki and Satish Kumar won their respective semi-final bouts and will look to strike gold for India; whereas fellow teammates Naman Tanwar, Manoj Kumar and H Muhammad had to settle for bronze. Indian men’s hockey team lost their semi-final clash with New Zealand 3-2 despite putting up a good fight and will now fight for the bronze medal along with the eves tomorrow. Dipika Pallikal/Saurav Ghosal beat Joelle King/Paul Coll 11-9, 8-11, 11-10 to advance to squash mixed doubles final. Indian shooter Anish Bhanwala, aged 15, created history by becoming the country’s youngest ever gold medal winner in the Commonwealth Games after he created a Games record in the men’s 25m rapid fire pistol event. Shooters Tejaswini Sawant and Anjum Moudgil won gold and silver respectively in the Women’s 50m Rifle 3 Positions at the 21st Commonwealth Games. India’s Manika Batra/Mouma Das take home the silver medal after losing 0-3 in women’s doubles table tennis final. In all, the day saw India adding 18 medals; including 5 gold to its tally as the games come to a close. 05.31 PM IST — Boxing: India’s Vikas Krishnan and Satish Kumar are through to the finals in their respective events. To fight for gold tomorrow. 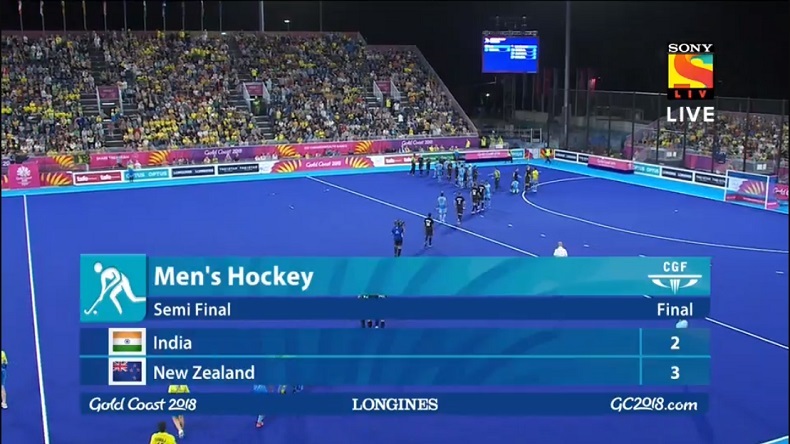 04.38 PM IST — Hockey: NZ win 3-2 and move to the finals! India tried and tried hard, but just couldn’t score on all those chances created. Part luck and part mistakes, but they put up a good fight. 04.30 PM IST — Hockey: GOALLLL! 3.49 minutes left and India have scored. 3-2. A similar finish like the one vs England, expected here. 04.28 PM IST — Hockey: The Indian coach using some similar tactics from the last match. He’s called back Sreejesh,means India now have 11 people to score. just under 4 minutes left and India still 3-1 down. 04.18 PM IST — Boxing: Bronze(s) for India! Boxers Manoj Kumar (69 Kg) and H. Muhammad (56 kg) have lost their semi-final bouts and hence take the bronze medals. 04.14 PM IST — Hockey: Could’ve been India’s quarter had it not been for that penalty goal by NZ. But India played with an attacking mindset, created a lot of chances biut failed to convert any of them. 04.09 PM IST — Hockey: GOAL! NZ score another, off a penalty in the third attempt. but have to say, it was a controversial decision in the first place as India lose their video referral too. NZ 3-1 India. 04.06 PM IST — Table Tennis: Its a Silver! after putting up a good fight, the duo goes down 3-0 as they lose the third game 11-5. But its another medal from table-tennis nonetheless. 04.01 PM IST — Table Tennis: The pair of Batra and Das have lost the second game as well, this time it’s 11-4. 03:55 PM IST — Hockey: Brother Jared Panchia sent-off too, as India get another penalty corner against a 2-men down NZ. 03:50 PM IST — Table Tennis: In the Women’s Doubles Gold Medal Match, India’s Manika Batra and Mouma Das are currently 1-0 down against Singapore’s Feng Tianwei and Yu Mengyu after losing the first game 11-6. They’re 5-0 down in the second game as well. 03:35 PM IST — Hockey: India with a penalty corner as NZ skipper aaron Panchia served a yellow card. 03:15 PM IST — Hockey: Stephen Jenness scores another one as New Zealand go 2-0 up. India clearly missing their star player Rupinder Pal Singh who pulled up a hamstring in the last match against England. With that, is the end of the first quarter. India have to come out attacking. 03:00 PM IST — Hockey: The first Men’s Semi-Final match between India and New Zealand gets underway. 02:30 PM IST — Wrestling: It’s raining medals for the Indian contingent in wrestling at Gold Coast as Mausam Khatri is the next to boost India’s medal tally in Australia. The Indian grappler wins silver in men’s 97kg freestyle wrestling. 02:20 PM IST — Wrestling: While Pooja lost to 5-7 to defending champion Odunayo Adekuoroye of Nigeria in the final at Gold Coast, Divya Kakran defeated Sherin Sultana of Bangladesh by pinfall to earn a much-deserved bronze medal. 01:55 PM IST — Wrestling: Divya Kakran has won a bronze in freestyle wrestling as wrestlers continue to shine on Day 9 of the 22nd Commonwealth Games at Gold Coast. 01:35 PM IST — Wrestling: Silver for Pooja! More glory for India in wrestling, Pooja Dhanda has won silver in women’s 57kg category at Gold Coast. 01:25 PM IST — Wrestling: Star grappler Bajrang Punia has won his gold medal bout against Wales’ Kane Charig. Punia turned out as the better grappler in both the rounds to register his first gold at Gold Coast. This is India’s 17th gold medal at Gold Coast. 01:15 PM IST — Wrestling: Pooja Dhanda entered the final of the women’s 57 kilogram category for the first time. She defeated Joseph Tiako of Cameroon 11-5 in the semi-finals. Pooja took the lead in the opening minute of the first period with a two-point takedown. 01:05 PM IST — Wrestling: Indian ace grappler has confirmed her berth in the finals. Dhanda defeated Tiako 11-5 in the semi-finals at Gold Coast. Dhanda was leading her bout against Tiako with a 9-2 advantage. 12:55 PM IST — Wrestling: Indian grappler Pooja Dhanda took a commanding 9-2 lead over her Cameroon opponent. Dhanda is taking on Joseph Tiako of Cameroon in her women’s 57kg semis. 11:35 AM IST — Bronze in boxing! Indian boxer Naman Tanwar wins bronze in men’s 91 kg after a hard-fought bout at Gold Coast. 09:35 AM IST — Gold in Shooting! Another Gold for India! 15-year old Anish Bhanwala has won the gold medal in men’s 25m pistol at Gold Coast. 07:55 AM IST — Double success for India in women’s shooting! Tejaswini Sawant has won the gold medal in women’s 50m rifle event at Gold Coast. While Sawant claimed the highest honour from the event, her counterpart Anjum Moudgil has won the silver medal in the same event. 07:35 AM IST — Javelin throw final: After Neeraj Chopra, India’s Vipin Kasana has entered the javelin throw final, Kasan’s impressive 78.88m throw got him past the 78 mark which was enough for him to seal a place in the finals. 07:25 AM IST — Indian wrestlers continue to shine on Day 9: Mausam Khatri has wrapped up the tie in his favour against Alexios Kaouslidis of Cyprus. Khatri was declared the winner by technical superiority. Along with Mausam Khatri, Indian grappler Divya Karan in women’s division got the better of Gaelle Alakame Anzong. She defeated the Cameron international in her Group B 68kg bout. 07:00 AM IST —Table Tennis: More success for table tennis team for India at Gold Coast! Sharath Kamal and Mouma Das have entered the semi-final after beating Zhen Wang and Mo Zhang of Canada in the quarters. The Indian duo got the better of Candian by 11-9, 11-9, 5-11, 11-5 and will now see themselves with their counterparts Sathiyan and Manika in the semis. 06:50 AM IST — Rakesh Babu and KT Irfan removed by CGF: The accreditation of Rakesh Babu and Irfan Kolothum Thodi was terminated with immediate effect at 09:00 hrs today, Indian Express reported. Both athletes will leave Australia and board the first flight for India. Rakesh Babu was scheduled to take part in Triple Jump final but after CWG federation witnessed the no needle policy infringement, the Indian athlete has been asked to leave Gold Coast. 06:30 AM IST — BREAKING: For breaching the CWG no-needle policy, athletes Rakesh Babu and Irfan have been asked to leave the Games village. As per latest updates coming from Gold Coast, the Triple jumper and race walker have been removed from the ongoing CWG with immediate effect by Commonwealth Games Federation (CGF). More details awaited. 06:00 AM IST — Wrestling: Indian wrestler Bajrang has defeated his New Zealand opponent Brahm Richards in men’s 65kg event. Bajrang made a stunning comeback after being behind eight points in the initial round of the bout. With the win, the Indian grappler has entered the quarter-finals at Gold Coast. 05:40 AM IST — Commonwealth Games Day 8 Recap: India finished third in the medal’s tally on Day 8 with Indian ace grappler Sushil Kumar emerging as the lone gold medallist for India. Australia are first with 63 gold, 46 silver and 47 bronze. They are followed by England, who are second with 28 gold, 32 silver and 27 bronze. 05:30 AM IST — Hello and welcome to Day 9 LIVE coverage of the ongoing 22nd edition of Commonwealth Games at Gold Coast. With 14 golds, 7 silver and 10 bronze, the Indian contingent at Gold Coast have added 31 medals in their CWG medal tally and are currently ranked third in the overall medal standings.